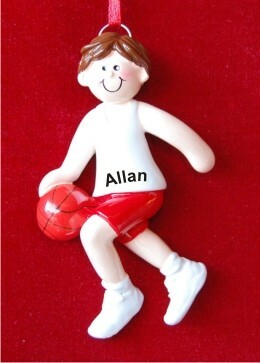 Bringing the ball up court or ready to cross-over the defender, this authentically styled brunette boy basketball personalized Christmas ornament is great for youth players from elementary through high school age. These basketball ornaments personalized to be enduring keepsakes include his name and the year, which our lettering artists add in a handsome, hand-drawn or painted font to produce a truly custom look. Just one of many personalized basketball gifts we offer, this one arrives ready to display in our handsome and plush velvet drawstring pouch. Show your support and encourage further fun and improvement with the brunette boy basketball player personalized Christmas ornament! For middle school son Dec 27, 2014 Jon T.